What a better way to add fun to your wedding ceremony. Wedding ceremonies are organised for both the couple and the guests to have fun, and it will be amazing for the best part of the fun to come from the couple through their wedding vows. 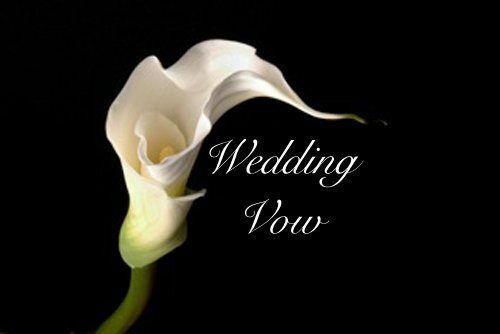 A few funny wedding vows will get your guest laughing and what an interesting wedding that will be. Here is a list of some of the most funny wedding vows you’ve never come across. 1. I promise to be true to you, to uplift and support you, to frustrate and challenge you, and to share with you the beautiful moments of life. Someday, if the stars align, I might even let you win an argument. 2. From the moment our paths crossed, you’ve surprised me, distracted me, captivated me, and challenged me in a way that no human being ever has. I’ve fallen in love with you, again and again, countless times, without reservation, and I still can’t believe that today I get to marry my best friend. 3. I promise to love you as much as I love my credit card and not hold your poor fashion sense against you. I will only show you my new clothes during commercial breaks and promise to keep you in the latest Cub fashions. From this day forward, I will make sure your lucky shirt is washed for every game day and will have plenty of potato chips on hand. I will love you for richer or poorer, as long as our credit limit stays high. 4. From this day forward, I promise to declaw my cat Fluffy so that you are not scratched. I will always make sure the litter box is clean and will keep Fluffy out of Spot’s house. I will love you for richer or poorer, so long as Fluffy gets the gourmet cat food. 5. I promise to love and cherish you as much as I do our dog, Spot. From this day forward, I will lint roll the chairs whenever your parents visit. I will love you in sickness and in health, as long as you take care of the vet visits. I promise to cuddle with you as much as I do Spot and pick you up treats whenever he gets some, too. 6. I vow to love you through the difficult and the easy. I promise to never put you or myself in danger. This means that I will never come between you and a mirror. I will also never force you to eat spicy food with me as I did on one of our first dates. I later found out that you were clenching your cheeks the whole night. 7. I promise to be there with you through the toughest of the trials in our life and to cry with you. These trials do not include things like YouTube footage of soldiers being reunited with their daughters. You’re crying on your own with those. 8. I promise to be there with you through the toughest of the trials in our life and to cry with you. These trials do not include things like YouTube footage of soldiers being reunited with their daughters. You’re crying on your own with those. 9. With you I have learned to take it slow, although I could have dealt with getting to this altar a little faster. When we met, all I knew was that you made me laugh and you had a dorky look, which I thought was hot. Only time would allow me to see your true colours. You’re generous, loving, sensitive, kind, an insomniac, and a lover of daily man baths and boxer dogs. 10. I take you to be my husband, the father of my children, and best friend until death do us part. Just stay away for one week per month! 11. I, (Name), choose you, (Name), to by my husband. In front of our friends and family, I promise to love and cherish you through every obstacle that may come into our path. I promise to learn how to check the oil in my car and how to roll up a garden hose. I will comfort you when your team loses and drink beer with you when they win. I will love you always. 12. I promise to love you as much as I love my credit card and not hold your poor fashion sense against you. I will only show you my new clothes during commercial breaks and promise to keep you in the latest Cub fashions. From this day forward, I will make sure your lucky shirt is washed for every game day and will have plenty of potato chips on hand. I will love you for richer or poorer, as long as our credit limit stays high. 13. I Michael, take you, Jessica to be my lawfully wedded (wife) and chief tennis doubles partner, for richer, for poorer, for better, for worse, in sickness and in health, for when we win and the very, very rare occasion when we lose. I promise to love, honour, and cherish you, to return your serves and do my best not to foot fault. This I vow to you. 14. I Chris, take you Debbie, to be my beloved wife. I promise to love you and be your faithful partner, for better for worse, for richer, for poorer, when the Jets are winning, and when they are losing, in sickness, and in health, and in Jets-induced sickness. I will be true and loyal, and cherish you for all the days of our lives. 15. I, Phillip, promise to count every penny that comes into our grasp and account for it using two-column ledgers and everything your accountant has done previously. I promise to love you, Amelia, unconditionally, in sickness and in health, till death do us part, even when you feel the need to accessorize with $400 shoes. 16. I, Tyler, promise to love you, Sarah, even though you have an obsession with Britney Spears and other girly pop music. I promise I will learn to love all of your favourite pop stars like Britney Spears and Madonna, and will not criticize your choice in music from here on out. 17. I, Matthew, take you, Emily, to be my awful wedded wife, to have and to scold, from this day fast forwarded for better but not worse, for richer, and not poorer, forget sickness only in health, to loathe and to cherish, till suspicious death do we part. 18. I promise to love you even when you refuse to let me watch the football, to cherish you even when you blow one week’s salary on yet another handbag, and to understand you even when you are at mad at me because of something that happened in a dream. 19. I, Mark, do take you, April, as my bride even though you and I know you ain’t right. I reckon as long as you bring me my Bud Light things will be fine. I promise I will try to eat your cooking as long as you don’t make me look at it first. 20. “Jamie Marie, from this day forward I promise to be worth it. Worth the time. Worth the trip. Worth the energy. Worth the embarrassment. Worth your love. I promise that you will always count. You will always come first, and of course, if you don’t for whatever reason, I will buy you some shoes. 22. I, (name), take you (name), to be my (wife/husband), to have and to hold from this day forward, for better or for worse, for richer, for poorer, for even poorer when I’ve been shopping a lot, in sickness and in health, to love and to cherish; from this day forward until death do us part. 23. From this day forward, I promise to declaw our cat Fluffy so that you are not scratched. I will always make sure the litter box is clean and will keep Fluffy out of Spot’s house. I will love you for richer or poorer, so long as Fluffy gets gourmet cat food. 24. Minister to Bride: Do you take this man to be your husband? Bride: I do. Minister to Groom: Do you take this woman to be your wife? Bride: He does. 28. (Name), from the minute I saw you the first time, I knew you were the unified with whom I wished to share my all things. Your good looks, heart, and intelligence motivate me to be the perfect person I might be. I guarantee to love you for endlessness, regarding you, respecting you, being dedicated to you, and sharing my whole life with you. This is my grave pledge. 29. I (name) avow my affection to you, (name) as I welcome you to share my life. You’re the most pretty, savvy, and liberal person I’ve ever known, and I pledge always to admire you and respect you. 30. (Name), today I become your (wife/husband) and you become my (husband/wife). I’ll try hard to provide for you the best of myself while tolerating you the way you’re. I assure to regard you as an individual person with your own particular thoughts, hobbies, and desires, and to understand that those are now and again diverse, yet no less vital than my own. I pledge to keep myself open to you, to allow you into my deepest feelings and sentiments, mysteries and dreams.